The Internal Revenue Service issued guidelines Tuesday that will allow tax relief and refunds for some Bernard Madoff victims who were levied for investment earnings that turned out to be nonexistent. IRS Commissioner Douglas Shulman told Congress the guidelines are for taxpayers who have suffered losses from Ponzi investment schemes such as the massive Madoff swindle. Madoff investors should have reported earnings from their investments with him through the years and thus paid taxes on those earnings. Given that some of those were "phantom" profits, investors have said they should be entitled to refunds of the taxes they paid. Investors in some of these cases are entitled to a "theft-loss" deduction, not subject to the limits on normal capital losses from investments, according to the IRS guidelines, Shulman testified at a Senate Finance Committee hearing. The theft-loss deduction can be taken in the year a fraud is discovered, except to the extent an investor has a "reasonable prospect" of recovering the lost money, Shulman said. Determining the amount and timing of losses from Ponzi schemes is "factually difficult" and it can take years to determine the prospects for recovering the lost money, he noted. In Ponzi schemes, early investors are paid returns from money put in by later investors. "Some taxpayers have argued that they should be permitted to amend tax returns for years prior to the discovery of the theft to exclude the phantom income and receive a refund of tax in those years," Shulman testified. The new IRS guidelines do not address that argument, he said. 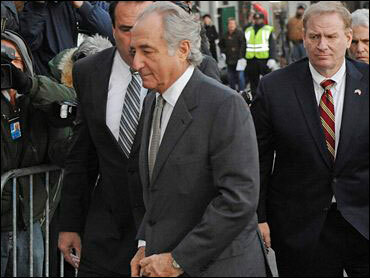 Madoff pleaded guilty last week to 11 federal charges stemming from his multi-billion-dollar fraud. His bail was immediately revoked and he's currently being held in the Metropolitan Correctional Center in lower Manhattan where he awaits a June 16 sentencing hearing. His attorneys are appealing the bail decision. Many victims like Bert Ross paid taxes on the fictitious earnings Madoff reported. Ross says he lost $5 million to the scheme, plus another $375,000 in taxes, reported CBS News correspondent Priya David. "Taxes on income I thought I had, which I never earned, because we never took money out. So that's phantom income. That money should be returned to us," Ross told CBS News. Sen. Charles Schumer, D-N.Y., a member of the Finance Committee who has been pushing for tax relief for victims of Ponzi schemes, said that with the new guidelines the IRS "has done the right thing here." "In most every area where there was a major dispute, they have sided with the victims," Schumer said. "These victims were not only sophisticated financial professionals, but also ordinary people who believed they were making safe, responsible investments for their future. The steps announced today mean victims won't owe taxes on income they never received." To date, about $1 billion in assets have been identified for Madoff investors, a tiny portion of the $65 billion he told his 4,800 investors that he had on hand in November. Authorities say they believe the figure included what would have existed if much smaller original investments had grown for decades. By some estimates, the IRS could be out as much as $17 billion in lost tax revenue from refunds to investors who earned fictitious profits in the Madoff scheme. And the Securities Investor Protection Corp., the industry-funded organization that steps in when brokerage firms fail, has begun sending out the first checks to Madoff victims. Investors are eligible for up to $500,000 from the organization and have until July to file claims. Around $1.6 billion or so is currently available to SIPC. Shulman said that investors should deduct the $500,000 they receive from SIPC from the amount they claim as a "theft loss" from their Madoff investment. The IRS expects that statements provided to investors by Madoff's fund, showing the amounts they invested, should be sufficient documentation to establish losses for filing tax claims, he told the hearing.